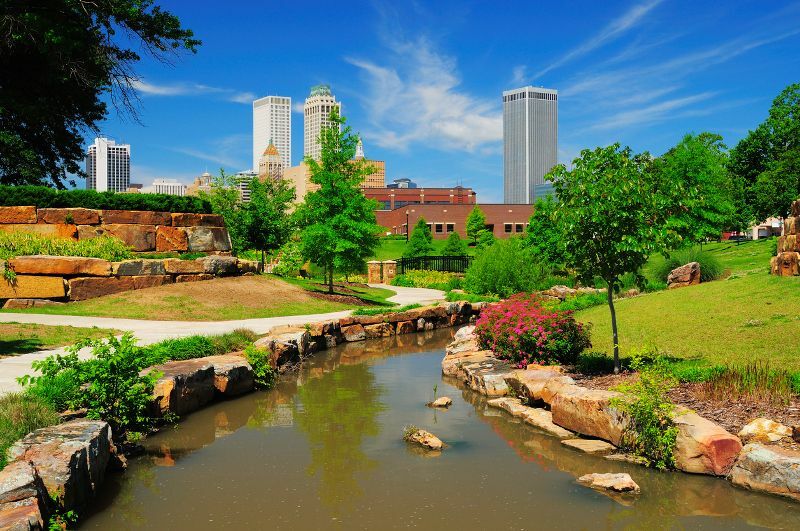 Architects… Take Notice in Oklahoma! When I think of Oklahoma, I think of winds rustling down the plains, not cities rich in Art Deco giants. However, this magical state includes many historic theaters, the controversial Marland Estate which stirred up all kinds of drama for the small town of Ponca City, as well as Tulsa’s skyscrapers and high-rises with over 50 floors and reaching heights of more than 650 feet. Oklahoma’s contribution to the architectural world also includes Frank Lloyd Wright’s Price Tower which includes the restored 19th floor executive office of H.C. Price. This skyscraper changed the horizon of Bartlesville forever and is a popular host for art exhibits, shows, receptions and sales. Have you ever seen a round barn? Oklahoma has one that goes back to the 1800’s. This unique architectural design known as the Arcadia Round Barn was originally designed and built in 1898 by William H. Odor, and was restored in 1992 by Luke Robison and the “Over-The-Hill” Gang. Mr. Odor soaked boards cut from native bur oak trees while they were still green in order to bend them in the curved shapes needed to form the sides and roof rafters. This is a “must see” if you are headed through Arcadia on Route 66. Architects in the great State of Oklahoma have a great reputation to uphold. In order to remain licensed they must complete 24 hours of continued education by June 30th of this year. In this hustle and bustle world we live in today, architect continuing education needs to be fun, informative, convenient, and affordable. Having the ability to complete your architecture CEU’s on your time is a plus. When looking for a resource, consider Architect Training Institute for a selection of fast, easy and affordable continuing education.